Earlier this week Larry Flick of Sirius/XM OutQ interviewed Adam Boy from the British pop group, The Dirty Disco. After a brilliant interview, I tweeted Adam and let him know I thought the interview was the tops and couldn't wait for them to come to America. He responded and threw me a courtesy XXOO and I thought, "That's cool. Not many celebrities would actually respond to a fan". So color me shocked today on Follow Friday when none other than Adam Boy name checked me...ME for a #FF. I spent the rest of the day in a sugar induced high and I now implore you. If you don't know who The Dirty Disco is, you need to. 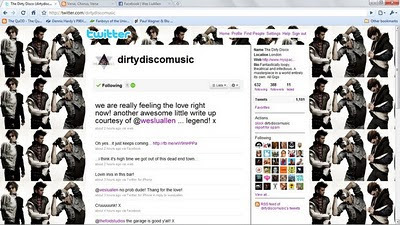 Here is the link to their Youtube Channel (http://www.youtube.com/user/thedirtydisco) I recommend you run to Youtube right now and watch the videos for Sista! and White Room. Do it now. You won't be disappointed. Ah hell, I'll just give em to you so you can watch em instead of working for it. Before you start saying they are biting the GaGa's style, check yourself. I see much more influence from Pete Burns than the "Mother Monster" any day. *****EDIT: After posting this review, Adam gave me super huge props via twitter and linked to the blog. 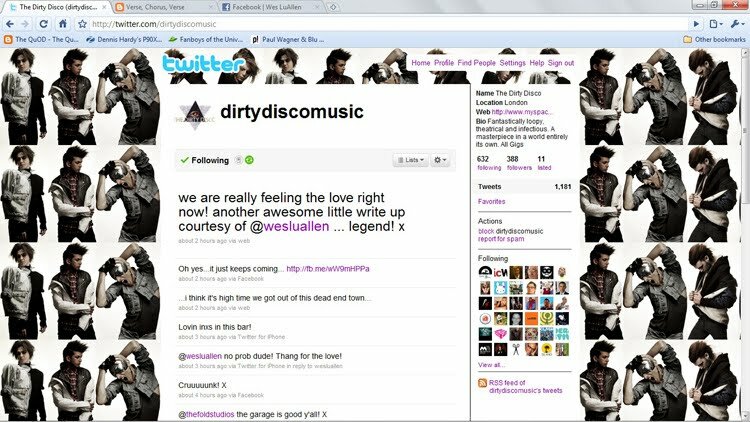 Being easily excitable, here's the screenshot.